English: Bluish-slate antshrike; French: Batara cendré German: Buschwürgerling; Spanish: Choca Guayanesa. PHYSICAL CHARACTERISTICS 6 in (14.5 cm), with a long tail. 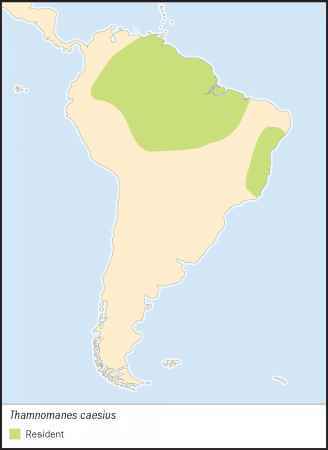 Much of northern tropical South America; east of the Andes in Venezuela, Guyana, Colombia, Ecuador, northeastern Peru, Amazonian Brazil, and northeastern Bolivia; coastal eastern Brazil. 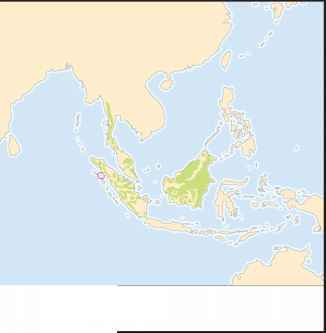 Up to 2,650 ft (800 m) in humid, lowland tropical forest, especially in terra firme (or non-flooded) habitats and mature secondary forest; lower-canopy habitats. Nonmigratory pairs defend a breeding territory, but may also associate with mixed-species flocks. The vocalizations are loud and distinct, and help to organize local, mixed-species flocks. Song is a series of notes and trills. Nonmigratory pairs defend a breeding territory. Both sexes sing a fast series of nasal notes; there are also several other calls. Feed in dense foliage on insects and other arthropods. Feed in dense foliage on insects and other arthropods. Prey is often caught in the air.